No one knows the cause of Colony Collapse Disorder. But it could mean ecological disaster. ALAN HENNINGER first noticed his bees disappearing two years ago. Henninger has been a beekeeper for more than 40 years. At his Henninger Hills Apiary, just south of Alum Rock Park, there are about 18 hives. Each box, which is about the size of a milk crate, has notes written on it to remind Henninger of the health of the hive, notes he is constantly updating. Henninger lost approximately 40 out of 100 hives in 2006. He rebuilt to 80 hives, but lost roughly a quarter of those the following year. While his apiary was crashing he would check his hives frequently. "You don't keep track of how many you lose," he says, "but how many you got." He would check a hive one day, and everything would be fine; check the same hive on another day, and all of the adult worker bees would be gone. He would purchase more queen bees and try to rebuild, but didn't know how to help them. "At first I thought it was my fault," Henninger says. "They are dying off, and I don't know what to do." Clad in faded jeans, a soft flannel shirt and a thick hat with a black mesh veil that covers his face, Henninger makes the rounds and checks on his bees, as he does at least a couple of times a week now. His weathered face and bright blue eyes scan the hives for any abnormalities. He has a few different areas for his hives scattered throughout the valley—some out on Mt. Hamilton, near his home, and some farther down the road, at a spot overlooking the Santa Clara Valley, next to a rusting abandoned car. Sitting in the cab of Henninger's old blue Toyota pickup, we can hear the buzz coming from little clouds of honeybees hovering around different boxes, where they are building honeycombs and filling them with nectar. In one hive, he points out that the honeycomb appears to be capped with wax. This, he poins out, is possible indicator of Colony Collapse Disorder. HIVE MINDER: Alan Henninger looks over his bees at Henninger Hills Apiary, south of Alum Rock Park. Over the last two years, he's lost between 30 and 40 percent of his colonies. This mysterious syndrome, recently named, has been decimating the honeybee population throughout North America and Europe since 2006. There is only one clue to indicate when it has hit: all of the worker bees in a hive disappear without a trace. 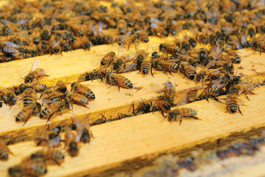 According to Eric Mussen of UC-Davis it can occur very quickly—a hive that was healthy three weeks ago can suddenly die. So far scientists haven't been able to pinpoint a cause, or anything that might help slow the massive number of disappearing bees. The cost of renting hives for crop pollination has gone up significantly, as beekeepers have been spending money to replenish their hives, and passing that cost on to farmers. Because more than 120 different crops depend on bees to pollinate them, farmers and agricultural experts are searching for new ways to replace this natural system. Whether they can or not, almonds will almost definitely disappear with the bees. Although Colony Collapse Disorder got its name in 2006, following the report of a series of collapses by a Pennsylvania beekeeper, it may account for declining honeybee populations dating back to the early 1990s. In the past two years, commercial beekeepers have lost between 50 percent and 90 percent of their hives, and smaller operations like Henninger's have also been affected. The bees in Santa Clara County are Western honeybees, which originally were brought over from Europe. Remember fifth-grade science: In each hive there are three different types of bees: a queen, drones and workers. The drones are there only to fertilize the queen. Young worker bees take care of the larvae and older ones leave the hive to bring in pollen and make nectar. 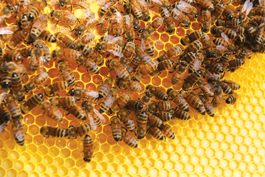 For reasons nobody understands, CCD is characterized by a disappearance of the worker bees, while the queen, nurse bees and brood are unaffected. Though no cause has been identified for this mystery bee-killer, scientists are studying many factors. Some have hatched theories that blame pesticides, parasites or nutritional issues—or a combination of all three. Others have placed the blame on varroa mites, tiny vampirelike parasites that act as leeches on the bees, draining them of blood. A fringe theory is that cell phones somehow affected the navigation of the worker bees, so they aren't able to find their way back to the hives. Henninger doesn't believe that one at all. "I would have been dead in the water years ago," he says. He has a cell phone antenna on his property. Every time Henninger found a collapsed hive the larvae, nurse bees and queen would still be there, but the workers—what he calls the "field force"—had fled. "What happens in CCD is you'll open up a hive and find a queen, and normally you'll find a lot of pollen and honey, but there's no field force. The field force is gone. And eventually as the young bees mature they turn to field force and eventually they disappear." If honeybees completely disappear, the agricultural community will be devastated. Honeybees contribute $14 billion to the agricultural economy, according to the U.S. Department of Agriculture. In addition to pollination, the National Honey Board reports that the bees produced about 180 million pounds of honey, which translates to about $600 million. Richard Adee of the American Honey Producers Association told a congressional hearing in 2007 that without honeybees the agricultural community would be lost. And still no one has any ideas how to battle this disorder—or what even brings it about. Henninger says he got started in beekeeping when he moved to Silicon Valley, mostly out of curiosity. He got one hive, and then got hooked. "The minute I opened my first hive, I felt like I'd been doing it all my life," he says. While walking around the hive boxes, Henninger talks to himself and to the bees. As he looks at the slats of honeycombs within the boxes, it's almost like he is asking permission to pull them out. Some of the bees land on his bare hands and Henninger keeps moving as if they aren't there. He gets stung from time to time, but barely seems to notice other than to scrape off the barb. Using what looks like a tiny bellows attached to a tin can, he pumps smoke into the hive boxes so the "ladies," as he calls them, get out of the way and won't sting him. The slats are stuck together with honey, so he must pry them apart before pulling them out to examine the brood. Most of the ones he pulls out on this particular day are heavy with pollen and brood. Little brown-and-gold bodies wriggle around on the honeycombs, so tightly packed together it's hard to differentiate them, although one is obviously different—the queen bee is almost twice as large as her workers. Henninger feeds them sugar patties and syrup. But as bees fly in, returning to the hive, a few are packing pollen. I can see the bright yellow sacks on their legs—although, looking around, I notice that there are no flowering plants in the area. Henninger says the bees will fly up to two miles to find food, though in the winter they usually don't travel that far because it's too cold. He has to give them nectar so they don't starve. A retired geography and history teacher, father of two and grandfather of three, Henninger keeps up with the current bee research that is going on throughout the country. He went to Lake Tahoe in November to attend the California Beekeepers' annual meeting, where CCD was one of the major topics of conversation. In California, the largest crop that relies on honeybees for pollination is almonds. California needs 1.3 million colonies of bees for almonds alone. That's about half of all honeybees in the United States. Almonds are a $2 billion industry in California, and the state's largest agricultural export. Beekeepers flood the Central Valley during February and March to work in the almond groves. They truck in thousands of hives from as far away as Pennsylvania. Already the price of almonds has risen thanks to the increasing cost of renting hives, which is up to $165 per hive for about five weeks. In 2003, the price was $45, according to the Almond Board of California. All told, the USDA reports, bee pollination is responsible for $15 billion worth of crops, and one out of every three mouthfuls of food. Honeybees are used to pollinate alfalfa, apples, avocados, cherries, plums, prunes—a total of more than 120 different types of crops. 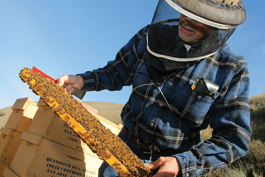 Henninger usually rents out his hives during February for almond pollination, although this year he probably won't head to the Central Valley and instead will help pollinate some orchards locally. After March, he turns to honey production, selling the honey out of his home in the mountains just outside of San Jose. This year he produced about two tons of honey, though he says that isn't much. There are three different types of beekeeper: hobbyists who usually have about one to five hives; sideliners who have about five to 300 hives; and commercial beekeepers who can have thousands of hives. Henninger fits into the sideliner group with around 80 hives. Over the last two years, he has lost between 30 percent and 40 percent of his colonies. Unless this mystery of this ecological breakdown is solved, he'll lose a second career he loves, as well as thousands of dollars a year. For the rest of us, CCD could turn into a bigger catastrophe. MOVING TARGETS: Bees inside the slats at Henninger Hills Apiary. Several hives like these have been hit with Colony Collapse Disorder. Two facilities, Pennsylvania State University and the USDA, are focusing on researching Colony Collapse Disorder. They are investigating multiple factors that could contribute to CCD: chemical residue, pathogens, parasites, nutrition and stress. One of the main sources of funding for research is Häagen-Dazs, makers of the much-loved premium ice cream, which has given $250,000 in grants. The company reports that about 40 percent of its ice cream flavors come from bee-pollinated crops. The USDA spent more than $7 million for bee research last year, including investigation into the cause of CCD. The agency also came out with a CCD action plan. Agency officials have laid out a four-point plan for battling CCD: data and survey collection, analysis of samples, hypothesis-driven research and mitigation and preventative action. Though large die-offs of bees have been seen in the past, the deaths aren't usually as high as those associated with CCD, nor are they usually so widespread. In European countries, nicotine-based pesticides are considered to be a major factor in the die-offs. These neonicotinoids have been banned in Germany, France, Italy and Slovenia in response to a few studies showing that they impair bees' abilities to navigate and forage. German beekeepers filed a complaint in August against Bayer CropScience to determine how much it knew about its pesticide clothiadin and its part in the death of the honeybees. But the U.S. Environmental Protection Agency said the bee die-off in Germany that occurred over the summer was not related to Colony Collapse Disorder. On its website, the EPA reports that though clothiadin was a factor in those die-offs, it was in combination with weather and problems with the application of the pesticide. Because of the findings in Europe, the EPA is currently looking into its labeling requirements for seed treatment pesticides to see if any changes are necessary. Bayer says that when used correctly, the pesticides are not harmful to bees. Clothiadin and other related pesticides rake in about $1 billion for Bayer annually. The USDA agrees that out of many studies done, most have shown that neonicotinoids have not had any affect on honeybees. The National Resource Defense Fund disagrees, and is suing the EPA for information that Bayer provided to the agency when the German chemical and pharmaceutical giant first received the OK to sell pesticides in the United States. "When clothiadin was approved for use by the EPA, they put a caveat in place that Bayer had to do further studies on impact on bees, and we are suing to find those documents," says Josh Mogerman, a spokesman for the NRDC. According to the California Department of Pesticide Regulations' website, clothiadin was introduced into California in November of 2004. USDA spokeswoman Kim Kaplan says the agency is "not specifically" looking into neonicotinoids as a cause of CCD. "We are looking at pesticides residues as a group and testing honeycombs and bees for signs of pesticide residues," says Kaplan. She says only one of many studies done on neonicotinoids has shown an adverse reaction in the bees, and that more research needs to be done before the agency would approve a ban. Bayer, Kaplan says, provided research into the affects of the pesticide when it first came up for approval. Critics of the pesticides are frustrated by the USDA's lack of action. "We think the government has been slow to react to this and needs to be putting a lot more into it," Mogerman says. Back in San Jose, Henninger will have to wait and see how his "ladies" get through the winter. One of his colonies is looking a little sick, so he transfers one of the healthy honeycomb slats to the ailing hive hoping the new influx of worker bees will reverse the damage. First he must remove the bees, so he carefully bangs the slat, and the bees explode off the honeycomb. He then inserts the now-empty slat into the new hive. The agitated bees buzz even louder, swirling in tight little circles around their disrupted home. "Excuse me, ladies," Henninger says as he pulls out a different honeycomb slat and looks past the horde of bees that cover it. He smiles. There is a brood in the combs, another generation of worker bees to come. He hopes.